Lend me a tenner…Oh, wait, I mean tenor! In fact, make it ten! 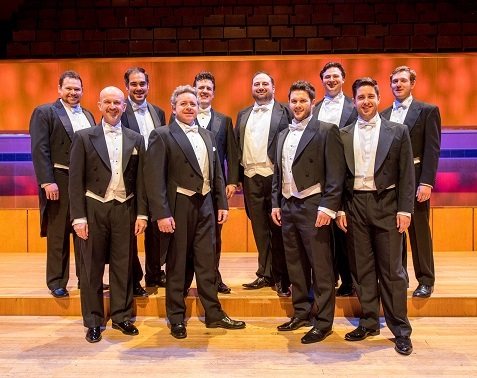 Wales’s contribution to testosterone-fuelled operatic singing, the Ten Welsh Tenors are back by popular demand with an amazing concert featuring 10 of the finest tenors from all over Wales with a feast of sumptuous popular operatic delights. The Tenners include Rhys Meirion, Aled Hall, Aled Wyn Davies, Richard Allen, Elgan Llyr Thomas, Trystan Llyr Griffiths & other guests will be joining forces to raise the roof for a special Gala Charity Concert at The Cardiff Metropolitan Cathedral of St David’s in Charles Street on Sunday 12th April at 7pm. ‘When all ten join together to sing Nessun Dorma, the hairs on the back of your neck are guaranteed to stand up – there’s nothing quite like it’ says Sharon Owen, Chief Executive of Welsh Hearts, a registered charity set up to fund the widespread provision of Defibrillators across Wales. Joining the ten Welsh tenors are Soprano’s Stephanie Edwards and Ellen Williams but as they are out numbered by the tenors, no doubt they will be showered with attention in the rousing Brindisi. Keeping company on stage to the tenors and sopranos are the award winning Choir ‘Cor CF1’ and accompanist Jeff Howard. All proceeds will go towards Welsh Hearts /Calonnau Cymru The Heart Charity for Wales – funding Defibrillators and Life Saving equipment through-out Wales.